Give them a play set that makes the most of their youth. Your child will be "King of the Hill" as they charge up the rock wall to overtake the fort at the top of this backyard play set. The Main Attraction is fun-filled with two scoop slides and an adventurous rock climbing wall. Kids will love showing off their strength and flexibility on the monkey bars and trapeze bar too. 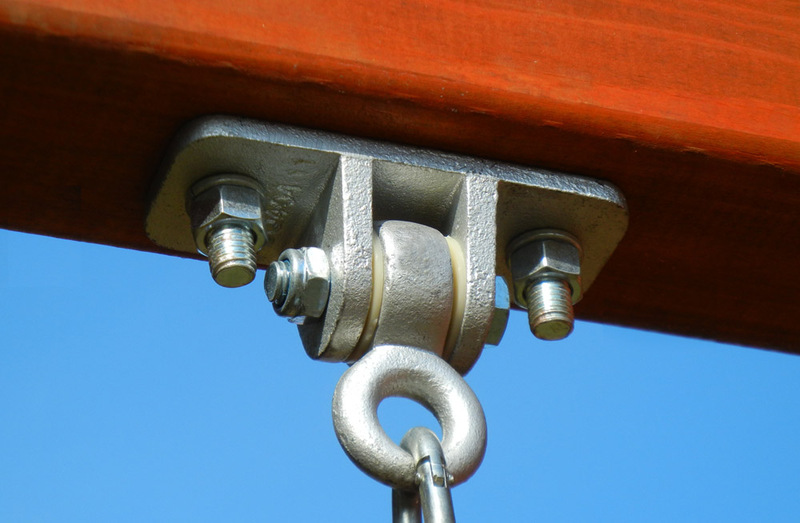 Next on the playlist is the 4-position swing beam. Children have the option of swinging right next to their friends all day long; or until the street lights come on. Underneath the shade provided by the spacious two-tier play deck, a tire swing with 360 degrees of motion and picnic table is included. If your child wants to sit down to recharge after hours of continuous play, the picnic table is the perfect spot. However, it won't be long until the swiveling tire swing becomes their preferred play activity. The amount of excitement and imagination is truly unlimited on the Main Attraction play set. 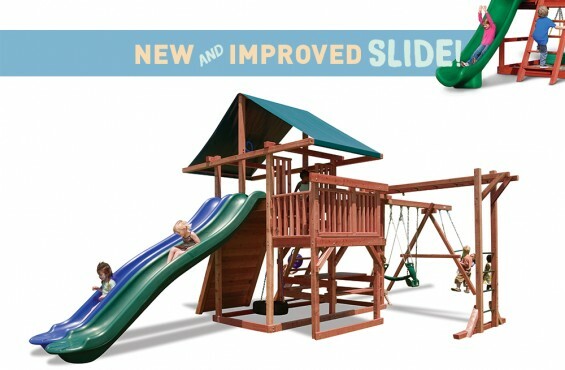 We design our backyard play sets to bring the excitement of the common playground to backyards across America. However, we have become the most respected play set manufacturer in the U.S. by putting safety first, always. As an active ASTM safety committee member, we have gone beyond the normal safety guidelines to ensure your kids are always safe. Here are the safety features included on our play sets. Add a fall suface (ground cover) under your play set. While our backyard play set are hand-crafted to eliminate unnecessary cuts and scrapes, we suggest adding a fall surface under your play structure to add another layer of protection for children – just in case they lose their balance and fall. We recommend to add rubber mats, rubber mulch, wood chips sand or pea gravel under your play set. To see a pros and cons list of the best materials for under a play set, check out the resources tab on this page. For a detailed guide on play set fall surfaces, be sure to check out our resources tab on this page. 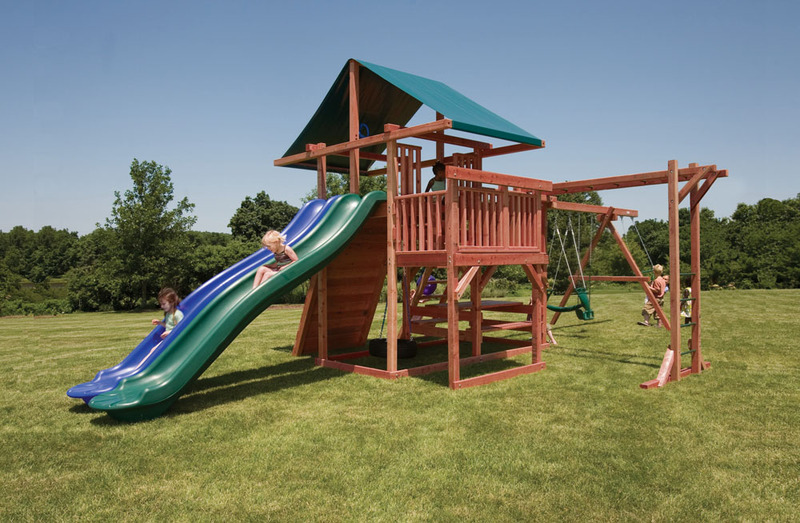 Once your play set is ready to ship from our shop in Monroe, MI, the delivery company will contact you to schedule a delivery date and time. The typical play set will be delivered curbside and comes in multiple bundles/boxes. Some larger packages may need to be opened and hand offloaded to the ground. It might be helpful to have another person help you bring the components into your backyard, but it not a necessity. The amount of space needed for a safe play experience may vary for each play set, but we suggest following ASTM’s guidelines of having a 6’ safety area around your play set. This area should not include any obstructions such as trees, plants, sheds or any other structures. In addition to the safety benefits of a 6’ clearance, it gives kids space to run around in your backyard all day long. 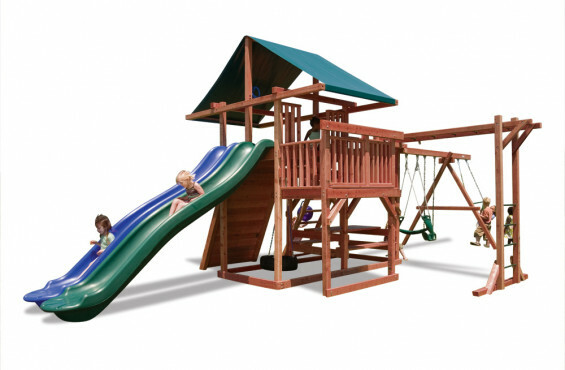 We also offer professional installation on our Premier Redwood Series of swing sets for $499. Periodic maintenance is suggested to ensure safe enjoyment of your play set and optional accessories. Be sure to check out wooden play set maintenance checklist within the resources tab on this page. 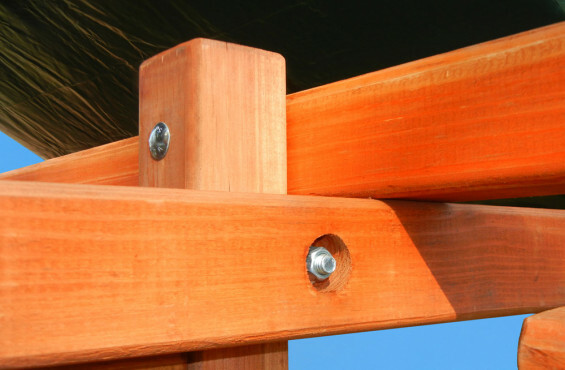 The High Wire play set is factory stained to provide a beautiful finish and long lasting protection. We recommend staining play sets once a year to maintain its rich color and naturally resilient qualities. Prior to staining, clean all wooden components. Use a high quality water based stain or sealant such as Thompson’s Water Seal® . After staining or sealing, please allow 24 hours to dry before allowing children to start their adventure. We have a playset that we personalized and built almost 5 years ago. We have 2 young children and countless others who have been on it at least weekly. It shows very little wear and for the first time we are doing some maintenance on it. We powerwashed and will be resealing it. It looks brand new! Thanks for a quality product!